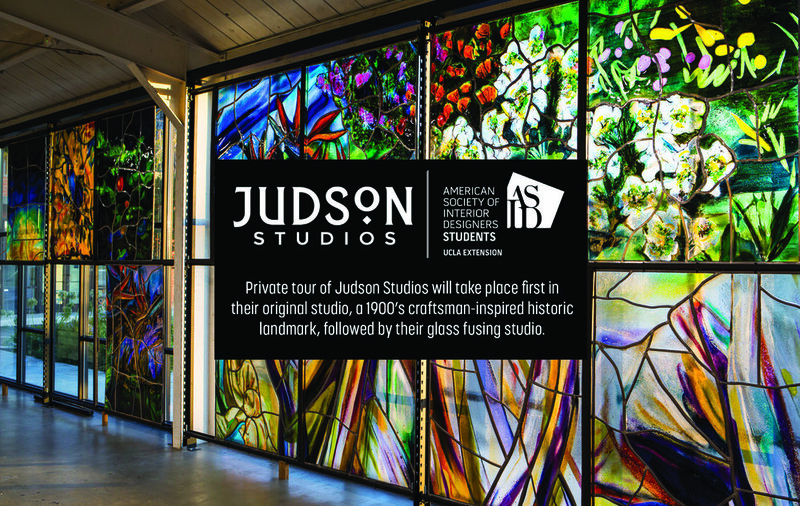 Get inspired for Spring Quarter with a private tour of Judson Studios! You will learn all about Judson Studios’ famous work – from the original Hollyhock House windows for Frank Lloyd Wright, to modern hospitality applications at the Ace Hotel in DTLA! Learn the ins and outs of paint with BEHR National Trainer, Holly Swanson. Get inspired with BEHR Color Expert and Interior Designer, Rob Hellander. We are thrilled to have Behr visit us on campus Wednesday, February 13th for a workshop that will be sure to color your world! 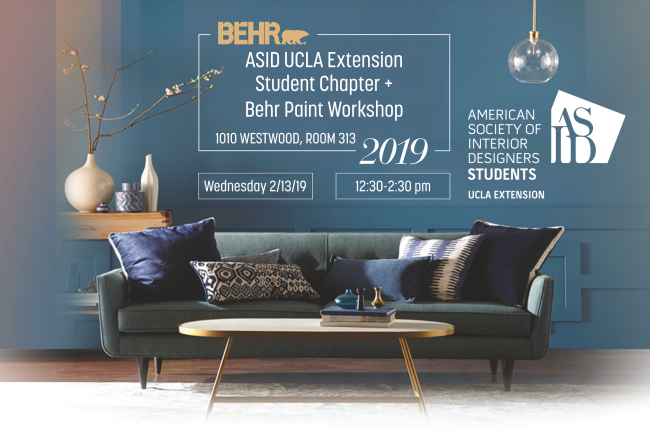 You can expect to learn from Behr industry professionals, enjoy a free lunch, and socialize with your fellow UCLA Extension Arc ID classmates - all while learning the ins and outs of paint. And if all that isn't enough, come out to receive an Amazon gift card and be entered to win a SWAG bag! Come celebrate the end of finals and ring in the holidays with us at our annual Arc + ID winter event! JOIN US, and the Museum of Neon Art, for a cult-favorite, award-winning tour of neon signs, movie marquees and contemporary neon art installations through Downtown LA... All aboard a British double-decker bus! From the glittering lights of the theater district to the glowing pagodas of Chinatown, our beloved guide, Eric Evavold, will delight you with architectural histories, anecdotes, and amusements as we drive deep into the urban electric jungle of this richly historic quarter of LA. Prizes will be raffled off, including TWO UCLA EXTENSION ARC + ID CLASS CREDITS! We are excited to be touring a job site in Santa Monica with Gabor + Allen! PARKING: As a courtesy to the construction crews, please do not park in front of house. Park further up Esparta and walk down. PLEASE NOTE: Appropriate construction site attire is required to access property. Make sure to wear closed shoes (no sandals or heels) and long pants (no shorts, dresses, or skirts). Space is limited to 18 attendees. Students, faculty, friends, family, and guests are invited to join us for our annual Mix-It-Up! fundraiser. Don your cocktail attire and enjoy an evening at the lovely Mr. C Hotel in Beverly Hills on July 1. There will be live music, a silent auction, and a grand prize raffle drawing. Light fare and first drink are included; no-host bar thereafter. All proceeds go toward funding our community service project for PATH, People Assisting the Homeless. See a modernized residential rebuild with a bit of historical character honored, and soaring views from a Santa Monica site. Patrick Allen of Gabor+Allen will guide the tour, discussing challenges, reviewing plans and revealing the curious background of the property. Join us for a tour of KFA Architecture's Santa Monica offices and have an opportunity to inquire about anything you'd like to know about working in the field and how to get your foot in the door. We'll gather for happy hour after the tour! Cost: Free for ASID members; $5 for member guests. Limited registration to 40 guests. PARKING: Street/metered parking on Olympic Blvd. Founded in 1975 by Wade Killefer, FAIA and Barbara Flammang, AIA, KFA is a prominent architecture and design firm based in Santa Monica, CA. Barbara and Wade were joined by partners Jonathan Watts, AIA; Lise Bornstein, AIA; and John Arnold, AIA in 2016. KFA provides architecture, design, and master planning services for projects throughout the greater Los Angeles metropolitan area and beyond with a goal of sustainability and urban revitalization. The firm’s expertise encompasses transit-oriented developments; mixed-use housing, retail, and office projects; affordable, senior, family, and special-needs housing; hotels and restaurants; educational facilities; and pioneering adaptive reuse projects, including more than 30 historic buildings in DTLA. A community and industry leader, KFA is an active member of AIA-LA and multiple other non-profits. Visit KFA's website to learn more about the firm. We are thrilled to present a well-rounded day of insider knowledge and a beginner’s guide to navigating the leading designer resource that is the Pacific Design Center (PDC) during the upcoming WESTWEEK. Join us for a continental breakfast, exclusive tours and presentations, and complimentary lunch. For more information, the full schedule of events, please click HERE. Cost: This event is complimentary to ASID student members. RSVP required by Monday, March 19th for catering needs. Join us on Sat. evening Jan. 20 at The Taiwan Academy of Los Angeles in Westwood for an art exhibition, ‘The Ocean of Memories’ curated by UCLA Extension Arc+ID instructor & Glass Garage Gallery owner/director Henry Lien. The Taiwan Academy will graciously provide wine and authentic Taiwanese food for this event. Learn how art has a place in every designed space. Cost: FREE, guests are welcome. Please RSVP for food & libation headcount ASAP. PARKING: Underground parking @ venue, enter north side of Lindbrook between Westwood & Gayley, $6 flat fee after 5pm. Also, Public Parking at 1036 Broxton Ave., Los Angeles CA 90024, $5 flat fee after 6pm.